From the artful mechanics of our favorite games to the stories they weave, designers work to create a gaming experience that feels seamless. But how do creators stamp each game with its own unique feel? How does the pace at which a game plays out affect the overall experience of playing it? Today, developer Brad Andres discusses the key design element of game flow and how it features in different types of games, including KeyForge! Hey everybody, how's it flowing? 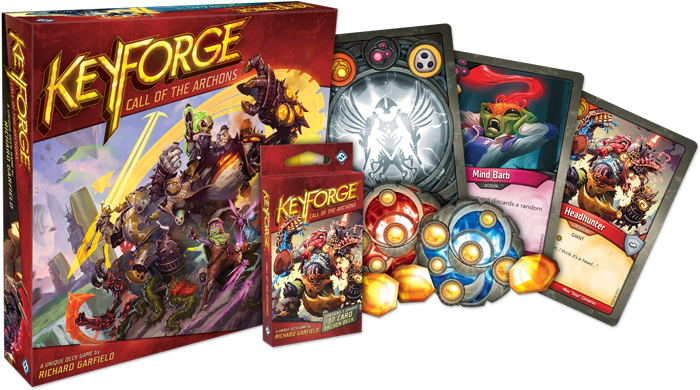 This week I’m going to explore another important element of game design, and specifically how it pertains to the gameplay of KeyForge. What element is that? Game flow, of course! Water we waiting for? Let's dive in! First of all, what is game flow? Simply put, game flow is the pacing at which a game plays out. A game’s flow can be… slow… and plodding… with very regular… intervals… between decisions. Or it can be fast!—withgreatburstsofdecisionstobemade! Or anything in between. 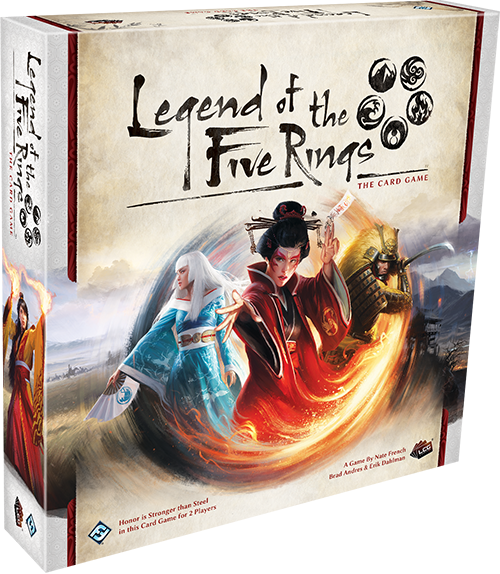 Game flow can also vary between different phases of a game, like how the conflict phase in Legend of the Five Rings: The Card Game involves lots of back-and-forth decision making and consideration, while the fate phase is relatively quick. Game flow can even vary between the same phases of a game, depending on how far along a game has progressed. 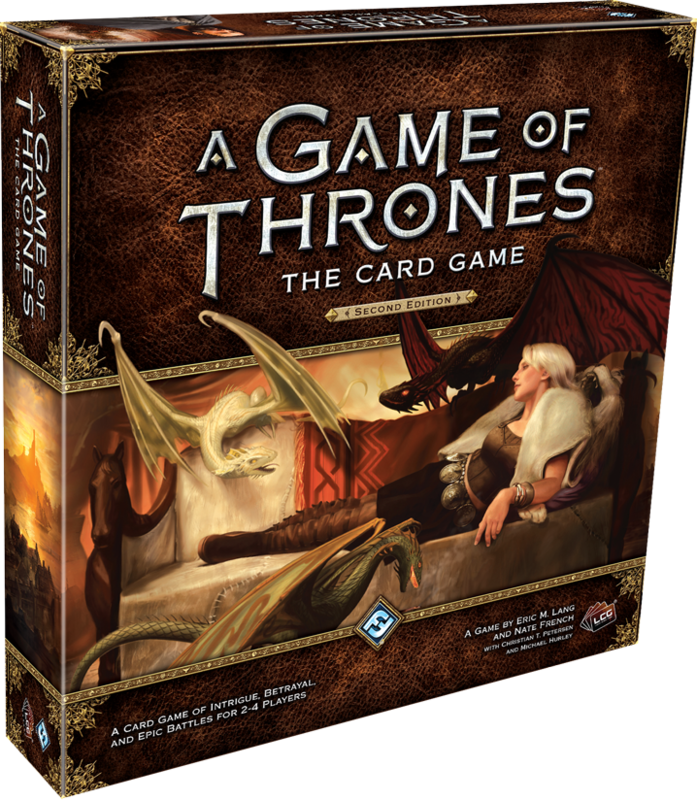 At the beginning of a match of A Game of Thrones: The Card Game, the board is relatively open and only a few challenges get launched or defended. As the game progresses, though, the game flow changes, and the challenges phase presents much heavier choices. But why is keeping this flow in mind important when we consider design? Won’t this flow naturally establish itself through the mechanics of the game? 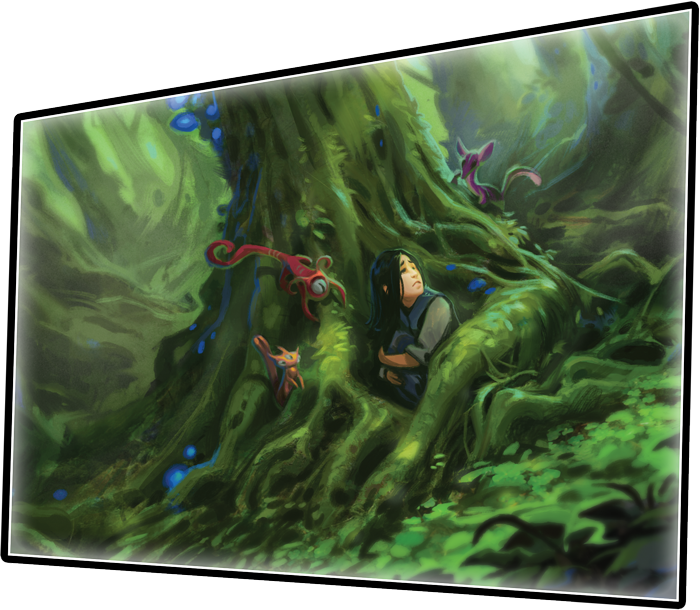 The short answer is yes, but the importance of game flow influences how we design cards and write rules. We want these elements to complement the game flow, not fight against it, so that the game feels like a well-oiled machine. Let’s take a look at this in action in a game with a particularly interesting game flow, KeyForge! KeyForge has an open and dynamic game flow that starts with a big initial decision, followed by a smooth turn that is ideally focused on playing multiple cards. This type of flow is established by pushing the most important decision to the beginning of their turn: which House will you activate this turn? By making this choice ahead of time, the player is free to make a series of smaller decisions in rapid succession, playing cards from their hand and using the cards they already have in play. 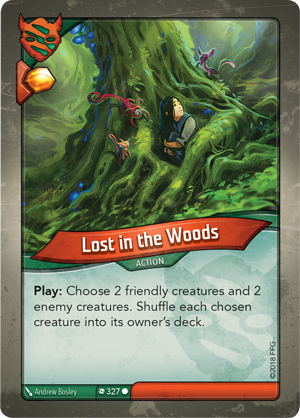 In addition to getting the most difficult decision out of the way early, game flow is aided by the fact that cards in KeyForge typically have no costs associated with playing them. This allows the players to play out the cards from their hand quickly without worrying about whether they have the resources to do so. 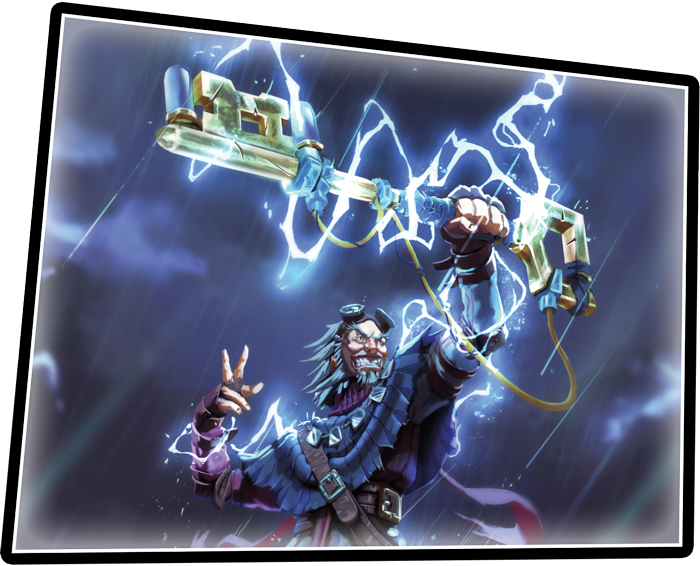 To facilitate this unique game flow, KeyForge takes an approach to handling card resolution that helps players play cards much more freely. We call this approach the “Resolve as Much as You Can” principle. The “Resolve as Much as You Can” principle states that you don't need to be able to resolve all of the effects of a card. 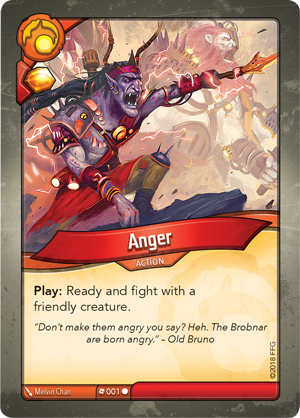 You simply, well… “Resolve as Much as You Can!” This makes KeyForge function very differently from many of our other competitive card games—typically in those games there is a rule that a card can't be played unless it has valid targets and its effect has the potential to change the game state. If players had to factor in elements like card costs, targeting restrictions, and whether a card effect would change the future game state, the big decision of which House to activate at the start of a turn would weigh heavily on many players' minds, and cause much of the game to suffer. By eliminating costs and embracing the “Resolve as Much as You Can” principle, the game flows naturally, and the player turns come together in a satisfying way! Here are a few examples of the “Resolve as Much as You Can” principle in action. I have chosen Logos as my active house at the start of my turn and begin by playing Remote Access (Call of the Archons, 120). However, my opponent doesn’t have any artifacts in play! So, what happens? 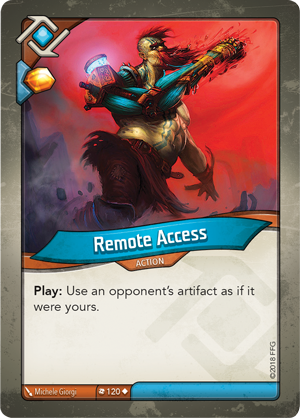 I can’t use an opponent’s artifact because they don’t have any, but I can gain an Æmber from the Æmber bonus on Remote Access. So, in this case, the “Resolve as Much as You Can” principle means that I can still play the card even if I can’t resolve any of the text except gaining the Æmber. I have chosen Brobnar as the active house during my turn and have just used Valdr (Call of the Archons, 29) to fight and destroy my opponent’s last creature. I then play Anger (Call of the Archons, 1) from my hand on Valdr. My opponent doesn't have any creatures left to fight, so the “Resolve as Much as You Can” principle swings to our rescue again by letting me perform the other functions of the card. In this case, I gain an Æmber from the card’s Æmber bonus and resolve as much of Anger’s text as I can. Since Valdr was exhausted from fighting earlier in the turn, and the first part of the Anger's ability instructs me to ready the friendly creature, I am able to do this part and ready Valdr. However, it's impossible to fight when there are no enemy creatures in play—I can’t perform the remainder of this card’s action, so I don’t! 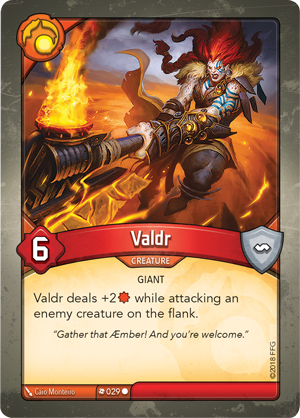 I now have a ready Valdr that could be used to reap another Æmber if I wanted. I have chosen Untamed as the active house at the start of my turn and have one friendly creature in play while my opponent has two creatures in their battleline. I play the card Lost in the Woods (Call of the Archons, 327) to clear my opponent’s battleline. However, I only have one creature in play! Here the “Resolve as Much as You Can” principle can help us out again. I gain an Æmber from the card’s Æmber bonus, but I can’t choose two friendly creatures to fulfill the card’s effect. In this case the “Resolve as Much as You Can” principle has me select as many creatures as I can and I choose the one creature I have in play. I then choose my opponent’s two creatures and all three of the chosen creatures are shuffled into their respective decks. As you can see, the “Resolve as Much as You Can” principle helps maximize the number of cards that can be played each turn, instead of having them stuck in hand. In turn, this ensures that the game flow of KeyForge remains where it's most fun; with players being able to frequently play all of the cards in the active House that they have in their hands. But each and every game has its own game flow that arises from the game’s mechanics, so remember to just go with the… well, you get it.